Laan der Verenigde Naties 115, 3317LV, Dordrecht. Q: What is the objective of the TESTFEST? A: The objective of the InterCor TESTFEST is to validate the interoperability of existing ITS-G5 services based on the common set of specifications developed in the InterCor project’s sub activity 2.1a. Q: Which services are tested in the scope of the TESTFEST? A: The services to be tested at the TESTFEST are In-Vehicle Signage (IVS), Prove Vehicle Data (PVD) and Road Works Warning (RWW). A: No. A PKI TESTFEST will be held at a later date. Q: Who is responsible for the organisation of the TESTFEST? A: The European project InterCor is responsible for the overall project management of the TESTFEST. The Rijkswaterstaat C-ITS Corridor project is responsible for the organisation of the TESTFEST. For more information on InterCor please go to https://intercor-project.eu/. For more information on the C-ITS Corridor project please go to https://itscorridor.mett.nl/home/default.aspx. Q: Can I still register for the TESTFEST? A: Registration for the TESTFEST is closed. Any requests for late registration will be addressed individually. Q: What is the program for the TESTFEST? A: The program for the TESTFEST begins with testing of the Road Works Warning system with related IVS in a lab environment (on Monday July 3 for preparation) followed by 3 days of open road testing with different RWW and IVS scenarios every day. In addition, the Dutch R-ITS-S (Road Side Units) will collect the Probe Vehicle Data during the whole event. Q: Is there a participation fee for the TESTFEST? A: There is no participation fee for the TESTFEST. Q: I would like to come to the TESTFEST as an observer. Is that possible? A: Due to the limited capacity of the TESTFEST test centre it has been decided that there will be no opportunity for observers, except for participants from InterCor Member States or Consortium. Q: Do we have to be present from Monday untill Thursday? A: No. However, we strongly advise you to take part in the desk and lab testing on Monday before entering the open road testing (Tuesday – Thursday). Q: We want to participate in the TESTFEST to test with our V-ITS-S (On-board Unit). Is it mandatory to bring our own test vehicle as well? A: We cannot provide test vehicles for participants. Participants can rent vehicles at local rental companies. However, if you come with an On-board Unit only, you have to bring along all the necessary equipment such as antenna, cables, adaptors, power supply, etc. Q: Will the list of participants be shared with all the participants? A: The list of participants will be shared with all participants before the TESTFEST starts on July 3rd. Q: Is it possible to bring extra team members? A: Only registered participants will have access to the test site. 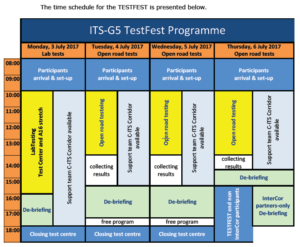 Due to the limited capacity of the TESTFEST test centre, participation is limited to three members per team on any given day. Q: At what time do we need to be present for the safety instruction in the morning? A: The morning safety instruction starts at 10:00am. However, since participants will be arriving at various times during the day we will provide additional safety instruction sessions. Q: What specifications are being used in the TESTFEST? A: The Dutch C-ITS Corridor Profile (version 3.0) will be the baseline for the TESTFEST. Q: What test scenarios do you propose? A: We will offer several test scenarios, both real life as well as virtual. These scenarios have been explained in the second TESTFEST webinar, recorded on June 2nd, 2017. Recordings of both webinars can be found here and here. Q: Where can I obtain detailed information about the TESTFEST? A: All committed participants have received a Plan of Action, the common specifications and test scenarios. The complete set of technical and informative documents can be downloaded here. Q: Is it mandatory to share our test data (e.g. log files)? A: No. InterCor partners will share their data although any data from other participants will be very much appreciated. Logging specifications will be provided. Q: We may have an issue providing our data in the requested log data format. A: Our mission is to convert the data during the TESTFEST. We therefore request that you analyse how to convert your log data beforehand. However, alternatively you can send your format to us in order for us to analyse and see if we can perform the conversion. To do so, please contact ERTICO – ITS Europe (see contact details further down). Q: Will you provide a “storybook” – an explanation of the data in the PCAP files? A: We do not have an exact storyboard to accompany the PCAPs. The PCAPs are ‘representative’ messages, not the actual messages which will be sent out during the TESTFEST. For the scenario’s that will be used during the TESTFEST we will provide storyboards (but no PCAPs). Q: Is the logic/coherence of the IVI messages in the PCAP correct? A: The PCAPs are just examples of IVI and DENM messages and do not represent real scenarios. If you have any questions regarding this subject please contact ERTICO – ITS Europe (see contact details further below). Q: Do we get information about the map segments (coordinates) used? A: The coordinates used are WGS 84 as specified in the Profile. Q: Is it possible to provide us with the geographic coordinates for the position of RSUs? A: The coordinates of the RSUs will be included in the technical and informative documents. Q: When do we receive the PCAP files? A: The PCAP files are included in the technical and informative documents. Q: We would like to have the event position in a DENM, is the end of the roadwork indicated in a DENM? A: We do not use the event history, it is not in our Profile. At this stage it is technically not possible to include the event history in the scenarios. Q: We would like to do some additional RSU testing, is that possible? A: RSU testing is not in the scope of the TESTFEST, the idea is to test service interoperability with the OBU’s from the different countries. So unfortunately additional RSU testing is not possible. Q: We have concluded that for every gantry that is showing restrictions, a IVI message is transmitted. For a gantry only showing blanks (no measures), no IVI messages are transmitted. Is that correct? A: Yes, that is correct. Also, please be aware that some of the scenarios are virtual. Q: What information is sent in IVI if a MSG (matric signs) is defective and the rest of the MSGs are showing a restriction? For instance: “50, 50, 50” should be shown, but “50, 50, -“ is shown above the road. A: We transmit exactly what the control system feeds back to us. So if there is a defect it will show a blank. Q: With regard to you answer above, can we rely on the number of lanes if we receive a blank? Otherwise we will receive the incorrect information on the user interface. A: We are looking into this matter and will inform you as soon as possible. Q: What information will be made available after the TESTFEST? A: InterCor will prepare a report as an output of the TESTFEST. This report will be downloadable from the InterCor website. Q: Is it allowed to publish an article and other publicity about our participation? A: We encourage communication about the TESTFEST. We would however ask you not to share anything that could be considered confidential. If you are in doubt, please contact ERTICO – ITS Europe (see contact details further down). Q: What is the address of the Rijkswaterstaat test centre? A: The address is: Laan der Verenigde Naties 115, 3317 LV Dordrecht, The Netherlands. Q: What facilities are being provided at the test centre? A: The test centre and service area will be fully available during the TESTFEST for all registered participants and visitors. The test centre will be accessible daily from 8:00 until 18:00. At the test centre the following services will be at your disposal: ample parking, catering, internet access, large meeting room with presentation equipment, several offices (on request) available for participants or for plenary sessions. Q: Can you list some hotels in the area? Q: If we have any further questions….? A: If you have any further questions please refer to Peter Schmitting, ERTICO – ITS Europe, p.schmitting@mail.ertico.com, and follow the weekly Q&A sessions every Wednesday from 13:00 to 14:00.